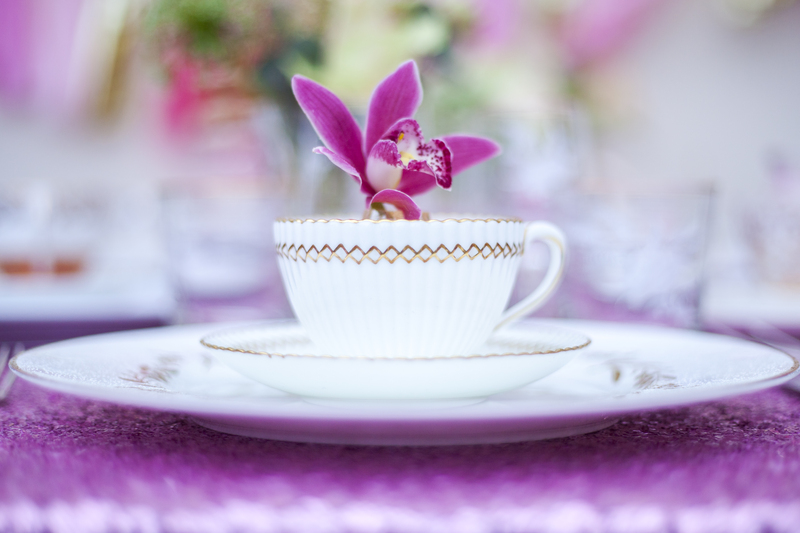 Vintage has been such a popular trend within the Wedding world, but this year a new trend is emerging involving sparkles. So what happens when you combine the two trends – Vintage Glam! 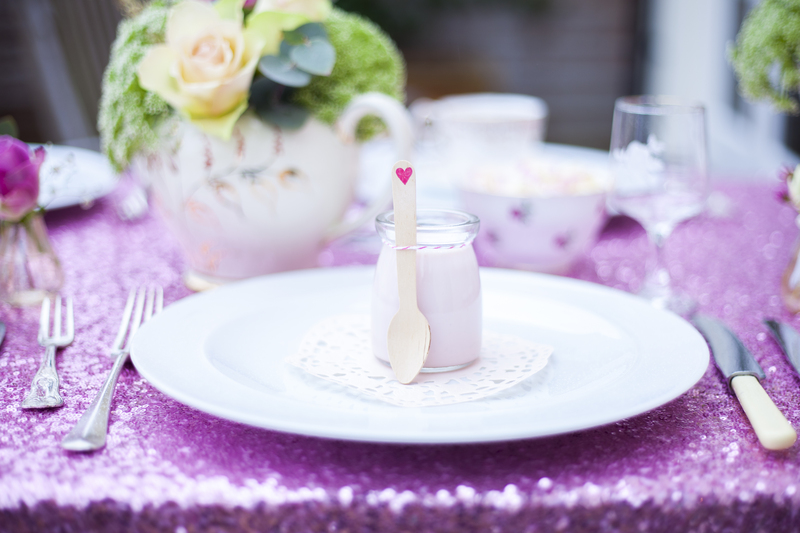 When planning your big day you will either look for inspiration from wedding trends or forge your own style, but you can’t deny that sequin linen is gorgeous, especially if you love a bit of sparkle! 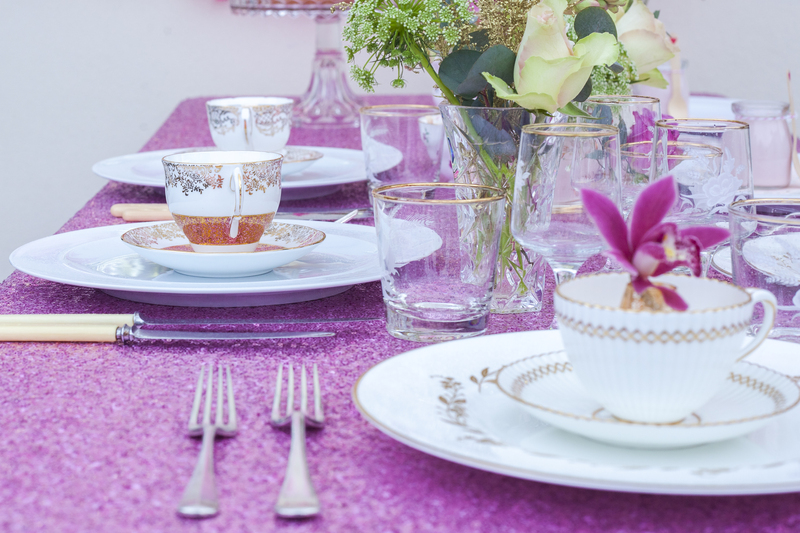 The pink sequin tablecloth is used as the backdrop to this vintage glittering table setting. Lots of brides love the vintage look but we decided it was time to glam things up and add some sequins. 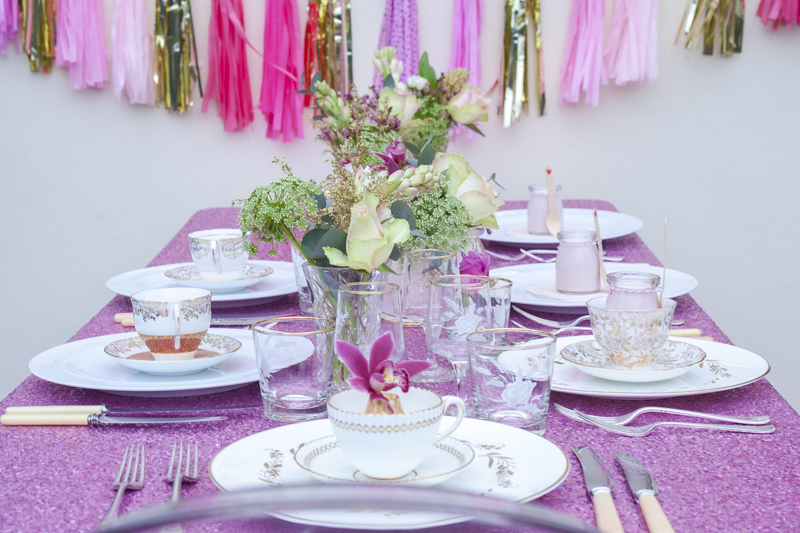 To take the sparkle to the next level you can add paper decorations, tassel garlands and props to compliment your table setting. Use ones that add more sparkle such as glitter or shiny metallics. 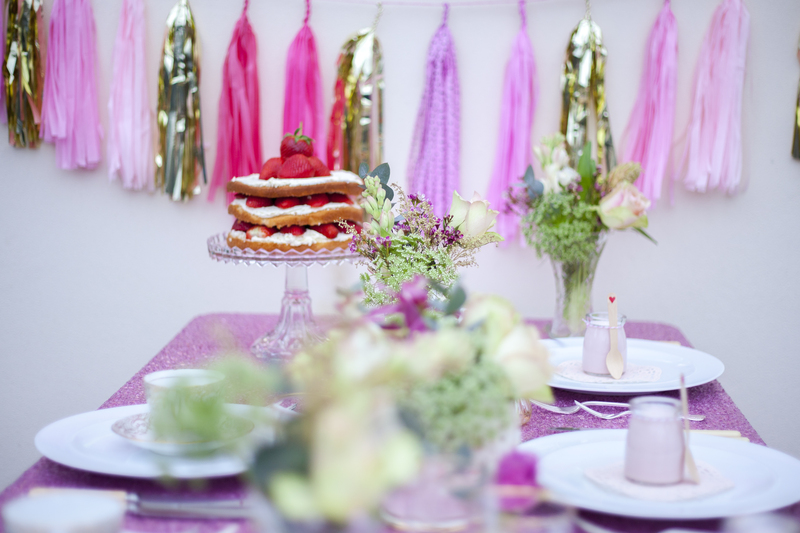 We have used a tassel garland which includes mylar, which is a shiny paper/film that compliments the table setting perfectly. Beautiful vases with flowers casually clustered in gold and pink tones give a relaxed feeling to the table to stop things becoming too formal. Scented tuberose and roses added the glamour along with gold foliage. I am definetely keen to explore this theme more with different colour sequins and decorations, time to get planning! Love to know what you think about this combo? 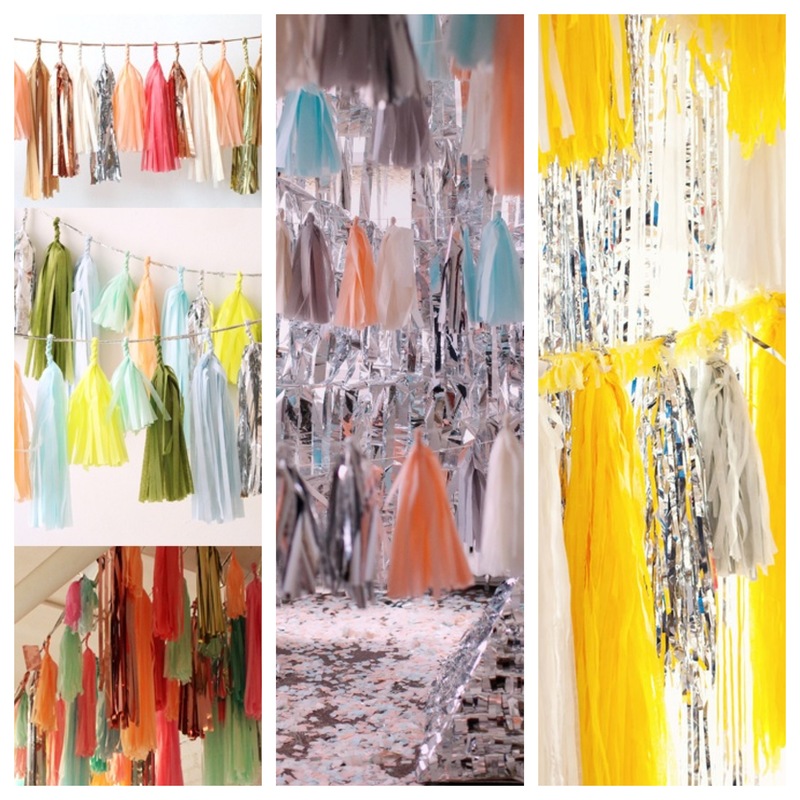 We just had a little tassel garland pin party and thought we would share the love, inspiration and glitter we have just discovered! You may be aware that we are now stocking some stunning tissue garlands. 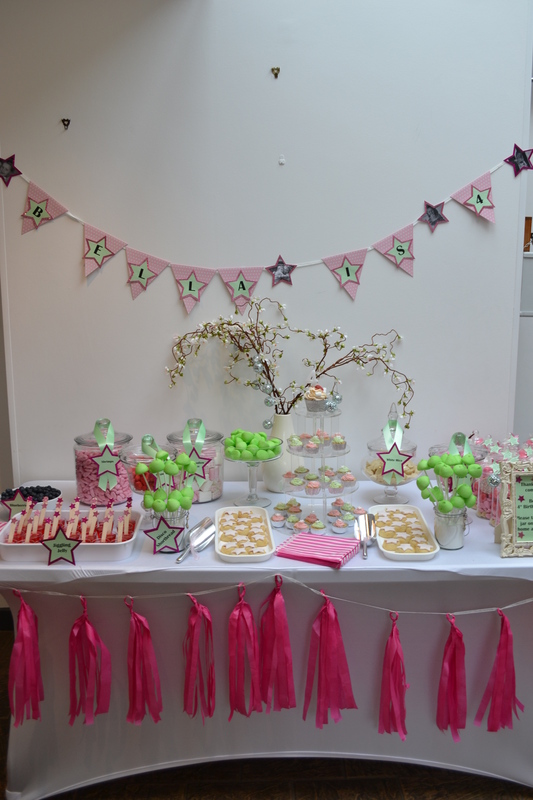 Not so long ago we created our first tassel garland for a 4th birthday disco party. I loved the instant colourful impact it made on the dessert table I created, but couldn’t believe the time it took to actually create! And as you can see from my version above, it isn’t as pretty and fluffy as the other versions around. Since then we decided to stock a range of homemade tissue tassel garlands on our website by a paper crafting expert! They not only look AMAZING they have been lovingly crafted with excellent quality tissue. My favourite garlands have a mixture of textures including mylar and tissue. They really make the garlands pop! We had a little pin party earlier and pinned loads of inspiration on our Pinterest board. If you have a moment go and check it out. In the meantime here is a little snapshot of the inspiration…. Brushing up on my photography skills…….